The theme of last year’s Shangri-La dialogue was the need to build trust and confidence. As Vietnam’s Prime Minister, Nguyen Tan Dung, said then: ‘If trust is lost, all is lost’. Well, trust is lost. This year’s Shangri-La is desperate for some law and a smattering of order. This year’s speech from Vietnam gives the flavour. The Defence Minister General Phung Quang Thanh, spoke in the session on ‘Managing Strategic Tensions’. His opening line praised the keynote address from Japan’s Prime Minister and Japan’s ‘positive pacifism’. Score that Japan 1, China 0. Thanh referred back to his Prime Minister’s trust line and lamented that ‘trust building is evermore imperative’. Then he turned to China, saying relations ‘have seen overall strong growth’ with ‘frictions from time to time’. For friction, read high-seas confrontations with China’s roving oil rig. 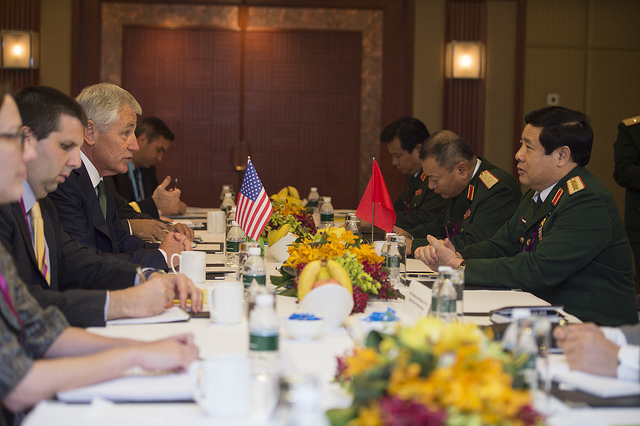 The General said China’s unilateral action in placing a deep water rig in Vietnam’s EEZ had caused ‘anger to the Vietnamese people and concerns to countries in the region’. While demanding that China withdraw the rig, Vietnam had used only coast guard and fishing vessels: ‘I believe that the army of the two countries must exercise utmost restraint, strengthen cooperation and tightly control all activities, avoid activity that may get out of control’. In questions, General Thanh said Vietnam was trying to talk to Beijing at every level using phone calls, letters, special envoys and meetings. The aim would be to persevere with negotiations and to maintain friendship. In contrast with some other signals out of Hanoi, General Thanh said taking the dispute to international arbitration was an undesirable, last option. For the time being, Vietnam will continue to do this the Chinese way—bilaterally. Whatever the score, those are China’s rules. The pleas for order so prominent in the Japanese and Australian speeches lead to the security guarantor; as Australia’s Defence Minister observed, the ‘US has underpinned the region’s stability for 70 years’. For the last couple of years, the US pivot has been the central element of the American Shangria-La show— what’s now the traditional first plenary devoted to the US Defence Secretary’s address. This year, the rebalance got less wordage because, in the words of Chuck Hagel, ‘The rebalance is not a goal, not a promise, or a vision— it’s a reality.’ That reality is being constructed by such things as ‘comprehensive partnerships’ with Vietnam and Malaysia and the new agreement on US forces in the Philippines, which Hagel called ‘the most significant milestone for the US-Philippines alliance in more than a decade’. Strengthening US regional defence capabilities. Incidentally, while championing those norms it’d be helpful if the US finally signed up to the UN Law of the Sea, as President Obama said yet again in his West Point speech. Not to do so is American exceptionalism writ large, and largely by US Senate peculiarity. The fireworks in Hagel’s speech were his description of China’s ‘destabilising, unilateral actions’. The US, he said, would firmly oppose ‘intimidation, coercion, or the threat of force’ to assert territorial claims. The pushback came from the head of Beijing’s delegation, the deputy chief of the PLA General Staff, Lieutenant General Wang Guanzhong, who announced he would depart from his prepared text to denounce the speeches by Hagel and Japan’s Prime Minister as coordinated, provocative and unacceptable actions against China. I personally think that this speech by Mr Hagel is full of hegemony, full of words of threat and intimidation. It was a speech [not] to abate destabilizing factors, [but] to create troubles and make provocations. It was not a constructive speech. Given the two speeches made by Mr Abe and Mr Hagel and if we look at the actions they have taken, we have to ask: who is actually making provocations and create troubles, disputes and differences concerning territory, sovereignty, maritime rights and interests, China has never taken the first step to provoke troubles. China has only been forced to respond to the provocative actions by other parties. And on bilateral and multilateral occasions, and on the Shangri-La Dialogue, China has never been the first to provoke disputes and troubles. I think everyone understands who actually initiated disputes and troubles. Secondly, from the speeches made by Mr. Abe and Mr. Hagel, we have to ask: who is actually assertive? It is the United States and Japan who are assertive in concerted efforts, not China. And China is only making, forced to make the minimum, lowest level of response to their provocation. So, trust lost, order wobbly. Graeme Dobell is the ASPI journalist fellow. He has been reporting from the 2014 Shangri-La Dialogue. Image courtesy of Flickr user Chuck Hagel.